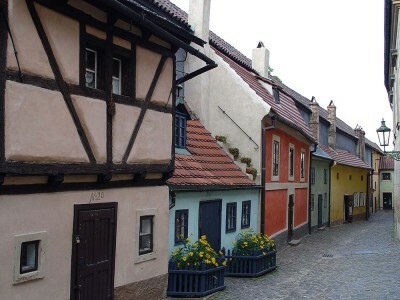 Golden Lane is among the most popular tourist attractions in Prague. It is part of the complex surrounding a castle and consists of a narrow lane which is lined with picturesque houses. The street takes its name from its earlier history in the 17th century when it was the home of a number of goldsmiths. The lane is located close to the external walls of the city castle, on its eastern side. Most of the houses along the lane date back to the 16th century, and were intended as residences for the men who guarded the castle for King Rudolph II. For this reason, the road was known as Archery Lane at that time. As the guards were gradually replaced by craftsmen, the street took on its modern name. A local legend has it that the street was occupied by a number of alchemists who were engaged in trying to create gold out of base metals. However, this was not actually the case. Although alchemists did live in the castle precincts, they were located elsewhere. In the first part of the 20th century, Golden Lane was the haunt of writers, including some of the best known Czech authors. The most prominent of these was Franz Kafka, who lived in a house owned by his sister for a short while during WWI. Jaroslav Seifert, the winner of the 1984 Nobel Prize for Literature, lived on the street as a young man in the 1930’s. Up until the 19th century, there were 24 wooden dwellings along the lane. At that time, however, the houses on one side of the road were condemned as slums and knocked down. The other dwellings were left intact. These houses were mostly lived in by the poor, but they became a magnet for criminal elements. These inhabitants were evicted in 1952 when the Czech government took on responsibility for the lane. During the early 1950’s, the houses were thoroughly restored and repainted, giving the street the brightly colored appearance that it has today. It is no longer a residential street, but instead a tourist-oriented commercial area, with bookshops and souvenir sellers taking up most of the houses. The street is operated on a ticketed basis as a tourist attraction.